Has anyone made a mod where you would be wandering around in an Egyptian tomb, fighting mummys? I'm not going to do one but I thought it would be a good idea. Yes. Quest for the Amulet by ISJ. Dang! I like some of the walls and sprites in that one. The liquor bottle is really good. It's hard to do with just a hand full of pixels. I did once attempt a mod set in a pyramid where you'd fight some baddies I hadn't even managed to picture in my head before the whole thing was scrapped. If you like RPGs with a twist of the FPS component, and if you have never played it, I highly, highly recommend you do play it: it is like nothing else I have ever seen from the DOS days. Hot to Rock - Long Live Metal! I downloaded Waxworks from the Internet Archive. From the little bit I've seen, it reminds me of Shadowgate. I used to play that game on my NES. As far as an Egyptian tomb mod, I'm picturing walls with hieroglyphs. various mummies, mummified dogs or cats. and big boss type mummies. They would throw knives, swords, and torches. Edit: Maybe they would throw wads of mummy wrap. Edit again: When BJ's health goes down, show his face getting mummy wrapped in the status bar. I think Mummy enemies alone would feel a bit too limited. I remember going this phase where I craved playing sort of game set in ancient Egypt. It would have enemies like bats, snakes, scorpions, and so on. Now that you mention it, Mummies would be extremely appropriate for such a game. * There was no electricity at all, so things like ceiling lights are out. We had candlesticks and "tin bowls of fire" instead. * Nothing was made of wood or brick. It was all sand, rocks, and stone blocks. * It was a dry environment, and there were no wells anywhere. People drank beer and wine instead of regular water. * Wild animals and reptiles were often used to kill an enemy more quickly. 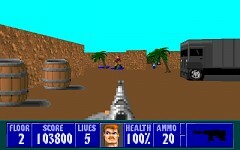 There were no guns back then, so doing this was faster than weapons that needed constant (manual) reloading. I remember watching this and thinking it was pretty neat. Seems like it could be fun even if just for a secret level maybe.